One of the most frustrating things about nutrition is all of the conflicting information we get from all the media we have access to. It’s hard to know what is true and what’s not true. It’s even harder to convince people that things they’ve heard from so-called credible sources are actually incorrect. One of the ways I’ve learned to deal with this bombardment of information is to do independent research and read trusted sources I have discovered on my own. One of the many reasons I wanted to do my internship with Tracie is that so much of her information is based on some of the same resources I had found before – and which I sincerely believe are on the right track regarding health and nutrition. Something I have done a bit of research on in the past few years is caffeine, and in particular, coffee. Up until a couple of years ago, my thoughts regarding coffee and caffeine were mostly negative. I basically considered coffee an addictive drug that people used to get through their hectic workdays. While I knew coffee had many important minerals – magnesium, for instance – in my mind the negatives still outweighed the positives. However, after further investigation, I’ve come to the conclusion that coffee isn’t so bad after all – in fact, it’s pretty darn good! – as long as it’s used in the right way. Let’s face it. Coffee has developed a bit of a bad rap. You may have heard that drinking coffee can lead to high blood pressure, fibrocystic breast cancer, maternal health concerns, anxiety, insomnia, dependency, and other issues. However, before we look at any of those things, let’s look at some of the benefits of coffee. Does that list make it sound like coffee is a bad thing? Here’s the scoop. For all the good coffee can do for us, if we’re not drinking it properly, it will do more harm than good. If you drink plain coffee on its own or a lot of coffee on an empty stomach, it will rev up your metabolism and increase your need for glucose, causing low blood sugar and an increase in adrenaline. This can make you hyper, nervous and edgy. Drinking coffee should give you a very slight lift. It shouldn’t make you nervous or hyper. If you are sensitive to coffee, start with small doses. Try 1-2 tablespoons of brewed coffee with some milk or cream, or add the coffee to a milk shake, and see how you feel. If you get no reaction, slowly increase the dose by a tablespoon. Make sure to drink coffee with milk or cream and a source of sucrose, such as cane sugar or honey. Drink it with or after a meal in order to keep your blood sugar balanced. Be sure to drink enough to give you a little dose of energy, using it as a nutrient with your meals instead of as a stimulant necessary to get you through the day. In general the most important food rule to follow for good health is to keep your blood sugar balanced. Drinking coffee first thing in the morning, on an empty stomach – especially black coffee, without the buffer of cream and sugar – is one of the worst things you can do. Not because of the caffeine, but because of the effect it has on your blood sugar – though the caffeine, as a stimulant, could exacerbate the effect. Whether you drink coffee or espresso, you should select plain grounds/beans without additives or flavoring. These additives can irritate the intestines. Non-organic coffee is actually an acceptable choice because the chemicals from the toxic sprays are destroyed during the roasting process. Decaffeinated coffee is a good alternative for individuals with caffeine sensitivities, because decaf is still high in magnesium, B1 and B3. 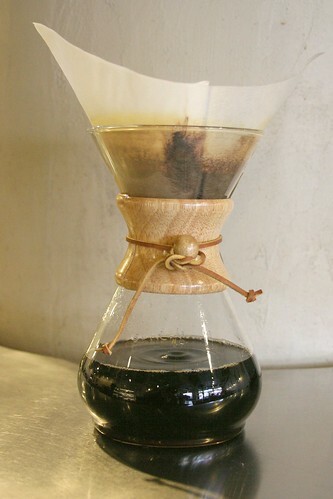 Overall, I believe coffee is beneficial, and can be viewed as another nutritional element in a complete, healthy diet. When consumed properly, with a meal and/or with added cream, coffee itself offers many advantages, most of which can be enjoyed by those with caffeine sensitivities by using decaffeinated options. Cao, C., Wang, L., Lin, X., Mamcarz, L., Zhang, C., Bai, G., et al. (2011). Caffeine Synergizes with Another Coffee Component to Increase Plasma GCSF: Linkage to Cognitive Benefits in Alzheimer’s Mice. Journal of Alzheimer’s Disease. Aoyama, K., Matsumura, N., Watabe, M., Wang, F., Kikuchi-Utsumi, K., & Nakaki, T. (2011). Caffeine and uric acid mediate glutathione synthesis for neuroprotection. Neuroscience. Kempt, K., & Martin, S. (2010). [Coffee and diabetes]. Med Klin (Munich) , Dec;105(12):910-5. Burling, A. (Sept2010). CAFFEINE ALERT! Scholastic Choices , 26(1):18-20. Glade, M. J. (Oct2010). Caffeine – Not just a stimulant. Nutrition , 26(10); 932-938. As a coffee lover I am thrilled by your research. With severe adrenal fatigue diagnosed a year ago I had given up coffee and am taking good care with diet, supplements, meditation and other practices. I have recently begun adding small doses of coffee (fair trade/organic) with cream and a spot of sugar — I have to say I am loving it! My brain loves it. Thank you for the good news. That’s terrific Kathryn. Like Tracie says, it’s all about balance and listening to your vehicle. I love coffee as well. I drink it every morning with cream and sugar. I’ve drinking black coffee on an empty stomach. I add sugar to it. Will it be a worst thing doing in this way? I feel refreshed after drinking the morning coffee. What all are the effects by doing so?